Have you noticed that tacos you can get today are different from what we had as kids? ("We" being used here for those of us who remember the '80s as a time of our youth.) 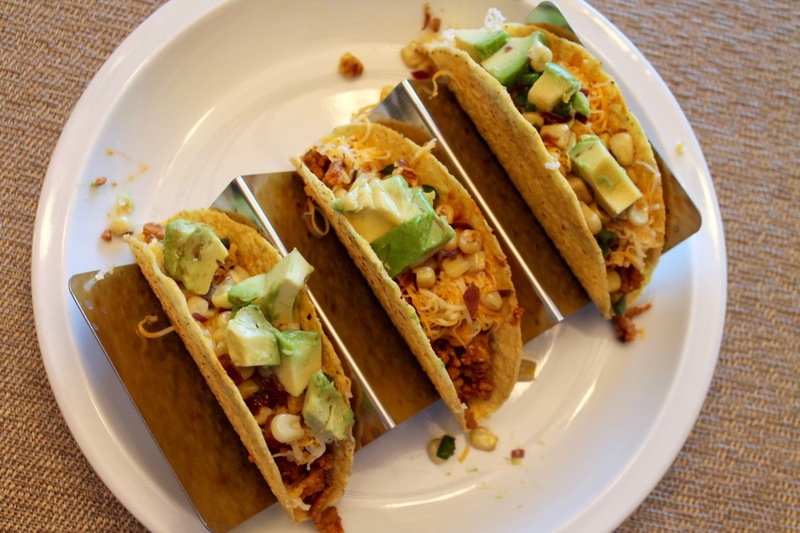 Tacos today are "authentic" dishes of fillings like carne asada or pork carnitas. They're served on freshly made corn tortillas and garnished with raw onion, cilantro and a variety of fresh salsas. They're amazing. Thirty years ago, tacos looked a lot different, at least if you were a child of suburban America where Taco Bell reigned supreme. Taco supreme, I suppose. Back then, a taco featured seasoned ground beef with shredded cheese, maybe tomatoes and lettuce, and crunchy corn shell. They were amazing...well, okay not really, but they were satisfying. Arguably, the tacos we can get today are way better. But sometimes, that nostalgic pull of food memory makes me yearn for the tacos of my youth. When you weren't eating tacos like that at Taco Bell, you could have them at home. 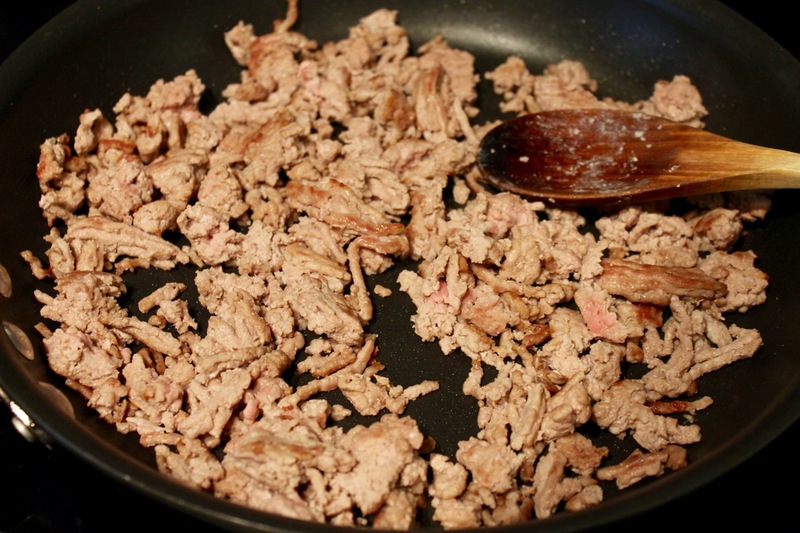 All it took was a taco kit, a pound of ground beef and a seasoning packet. This recipe shoots for reliving some of that '80s taco nostalgia with a few modern updates. I've replaced that seasoning packet with a custom seasoning blend. It's really not that hard to assembled the spices to make good taco seasoning. And you can customize this any way you want. Don't have onion powder? It's probably just as delicious with just garlic. Can't find Mexican oregano? Use the standard kind. 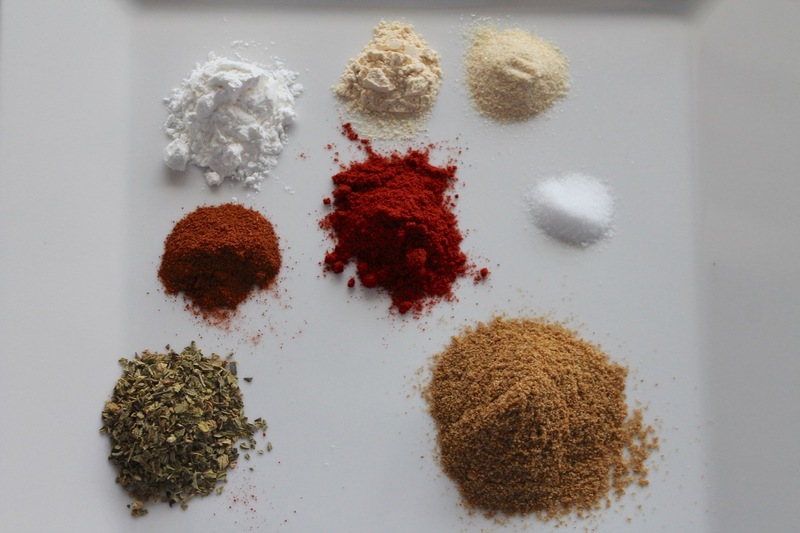 Want more chili powder? By all means add more. Making your own mix means you're in control, which includes dramatically reducing the sodium, if you are so inclined. I also made some alterations to the taco ingredients, swapping in ground dark turkey meat for the beef, using colby jack cheese (you and I probably used cheddar as kids), and garnishing the tacos with a quick spicy corn salsa and fresh avocado instead of tomatoes and lettuce (tomatoes aren't in season right now and lettuce is just boring on tacos). Having a little chipotle hot sauce on the side ain't a bad idea either. 1. Combine the seasoning ingredients in a small bowl and set aside. 2. 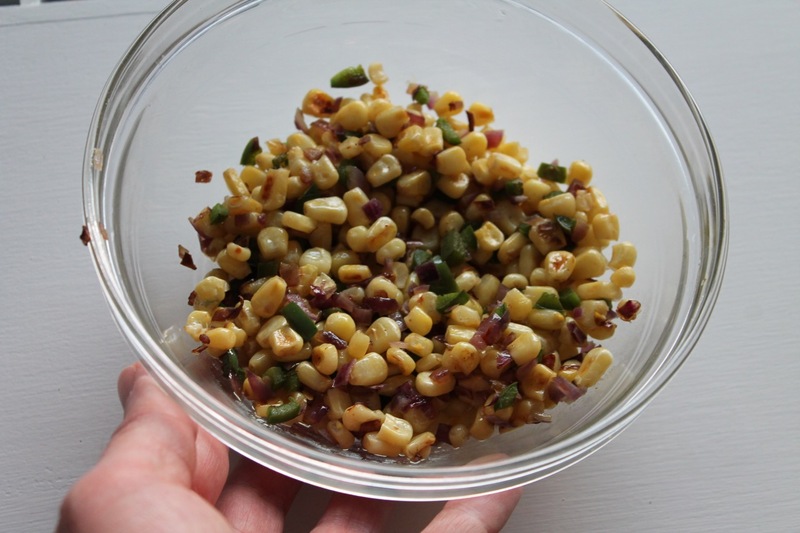 Make the corn salsa: Heat olive oil in a medium frying pan over medium heat. Add the corn, onion and jalapeño, season with chili power and sauté until lightly browned, about 6-8 minutes. Remove salsa from pan and set aside. 3. 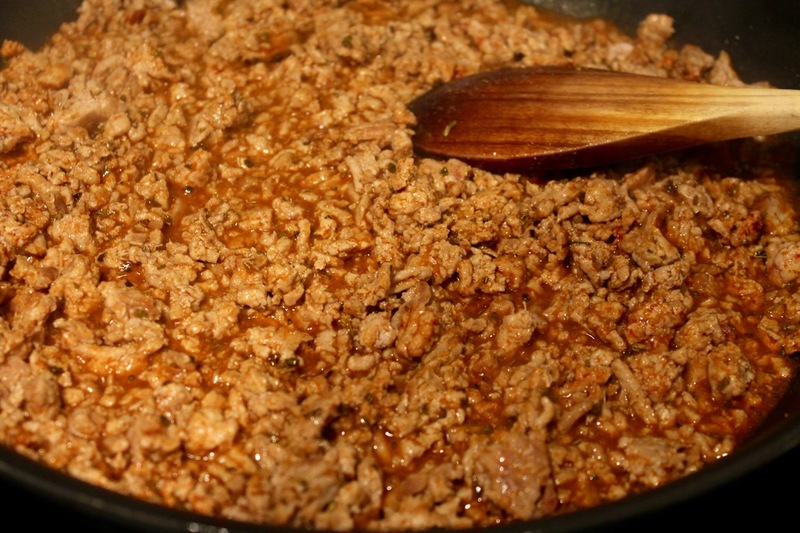 Make the ground turkey: Heat 1 tbsp. olive oil in a large frying pan over medium heat. Add the ground turkey and cook, stirring frequently, until the turkey is cooked through, breaking up with a wooden spoon as the meat cooks (when cooked, I chopped the meat on a cutting board to break it into smaller pieces). Stir in the spice mixture and cook another minute or so until the mixture is fragrant, then add the Worcestershire sauce and water. Reduce heat to medium-low and simmer until the sauce has thickened. 4. 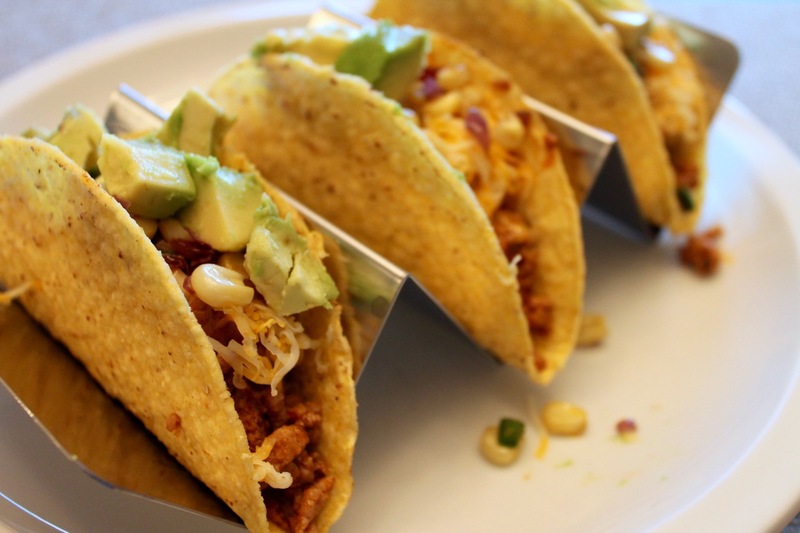 Serve the seasoned taco meat with the corn salsa, shredded cheese, avocado and taco shells. We're told that alleys are places to avoid. If you enter an alley in video game, expect to see the "game over" screen soon. Alleys are where you go to get robbed or stabbed. In Batman Begins, Bruce Wayne's parents are gunned down in an alley. You might be surprised then if I suggested an alley is the perfect place to go for a delicious meal served in an inviting setting with friendly service. I'm talking about The Dabney, which opened last year in the revitalized Blagden Alley in D.C.'s Shaw neighborhood just west of the convention center. Our recent dinner there was extraordinarily good. I'm still thinking about all the ways that Chef Jeremiah Langhorne, who recently worked in Charleston's under famed Southern chef Sean Brock's restaurant McCrady's, and has even worked at Noma (yes, that Noma), used fire, sorghum and locally sourced vegetables to craft a meal of memorable Southern-leaning dishes. The open-concept kitchen is the focal point of the otherwise simply adorned dining room. The beautiful wooden tables are nicely spaced to allow easy movement through the restaurant. The lights are romantically low--but not so low you can't see the menu. Instead, let your eyes wander over to the kitchen where Langhorne and crew work around a massive wood-burning hearth, using its smoke, flame and embers to do the restaurant's cooking. I can't wait to talk about the food, but first the cocktails. 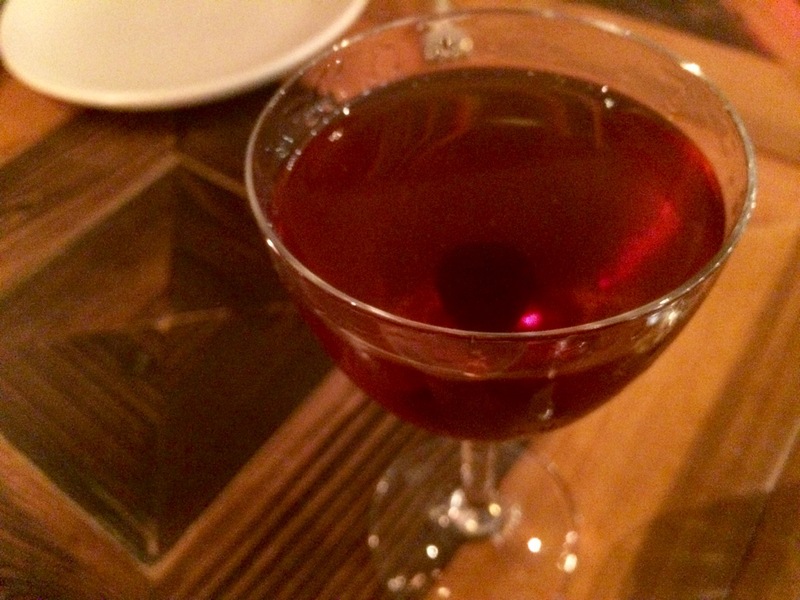 Bar Manager Tyler Hudgens, an alum of the Columbia Room, which recently relocated near The Dabney in Blagden Alley, has concocted a creative list of drinks that nicely complements the varied yet approachable flavors of the food. We're always up for a Manhattan, and loved the rye-based Homestead, its flavor pushed to a more pastoral place with house-made pecan-infused madeira. Also good was the pine-scented For Evergreen with old tom gin, maple and a wonderful pine liqueur, Zirbenz, which I must procure for my home bar. The Dabney's menu isn't divided into starters and entrees, although it's fairly easy to tell by the way the dishes are ordered and their price points which ones will work best for designing those two courses. After a delightful opening of lightly charred focaccia bread with sorghum butter, we sprang for the arugula salad with carrots--the root vegetable comes in both charred and raw-shaved forms--enhanced with peanuts, herbs and a toasted benne (sort of like sesame seeds) dressing. It's a good reminder to me to use peanuts more in salad, for I love the crunch and flavor they provide. 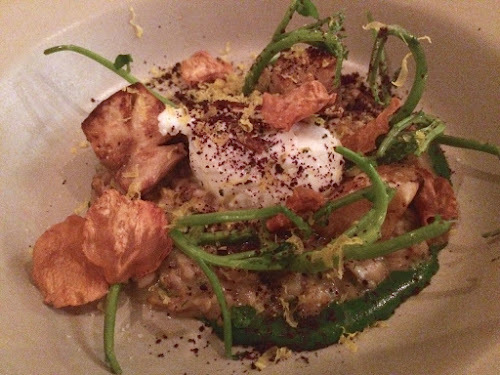 "Celery root baked in the embers," another winner, finds several roasted pieces of celeriac nestled atop a creamy oat risotto flecked with bacon, watercress and topped with a poached egg. Perhaps we just devoured these starters too quickly, but at this point in the meal, there was a rather long pause before our order of cornbread arrived. For those accustomed to a sweeter cornbread, be prepared for this more savory Southern rendition, nicely browned by that wood-burning hearth. A meal here wouldn't be complete without this--be sure to save some for mopping up the sauces that come with your entrees. Also, if you can save a little of that sorghum butter, it would be really good on the cornbread too. 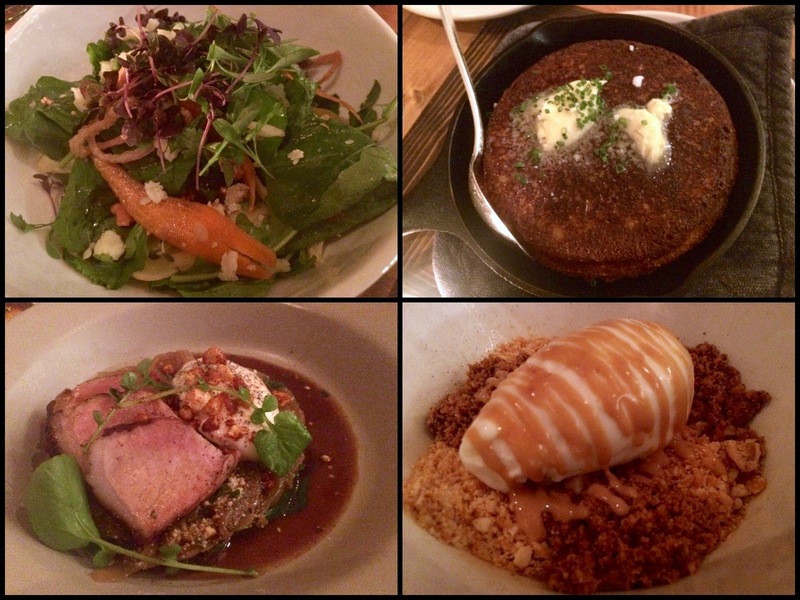 Both of our entrees were good, although the "Autumn olive pork in the style of bacon" was our clear favorite. 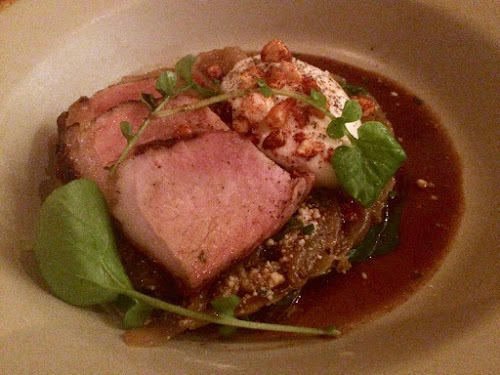 Several succulent pieces of pork arrive atop a pile of caramelized onions cooked in whey and served with spring greens and maple cream. It was one of the best pork dishes I've ever had. Less impressive was the lacquered quail, which was tasty, but when you're sharing a quail dish--as all dishes at The Dabney are shared--it feels insubstantial, since the little birds yield just a couple bites of meat. 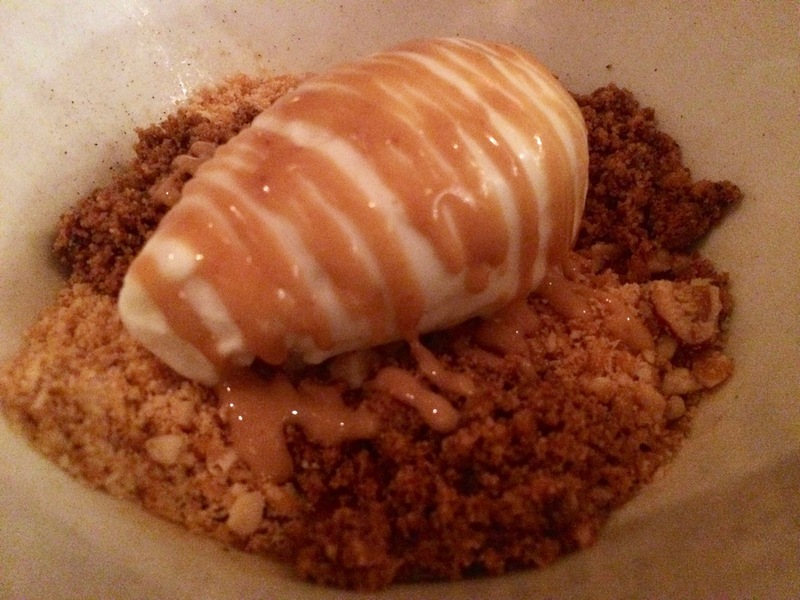 Sorghum returns for dessert in the sorghum custard, a decadent treat of brûléed custard topped with brown butter and peanut brittle crumbles, milk ice cream and a drizzle of peanut butter sauce. That's my kind of dessert, another highlight of the night. 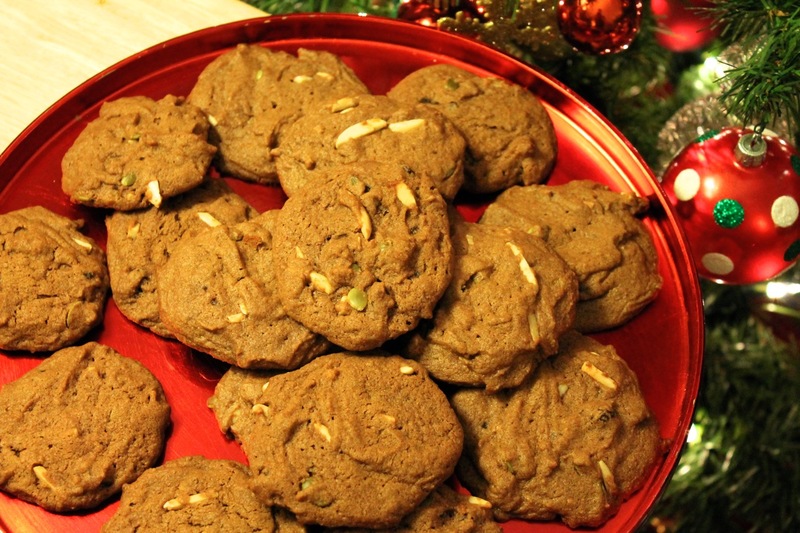 Along with the bad news (i.e., the bill), comes more good news: tasty little pecan-sorghum and ginger cookies. Besides the food, I was also impressed with the service. Everyone was unfailingly friendly and polite from the hostess to our server and even the chef, who wished us a good night after we paused a bit to watch his team in action around the hearth before we departed. I have no doubt that Chef Langhorne's name will be rolling off the tongues of D.C.-area restaurant aficionados in no time. In fact, the accolades for The Dabney are already rolling in. Zagat listed The Dabney among eight hard-to-get-into establishments along with Little Serow and Rose's Luxury (fortunately, unlike those establishments, The Dabney takes reservations). If you're still apprehensive about wandering down an urban alley to find dinner, keep in mind that Diagon Alley is where you go to find all the best magic shops in the Harry Potter world. 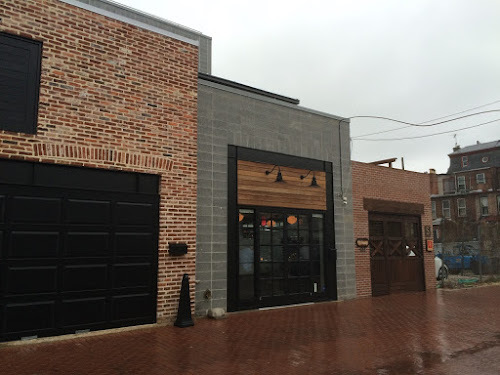 And in Blagden Alley, you'll find The Dabney brings a touch of magic to the real world. The Dabney, 122 Blagden Alley NW (between M and N and 9th and 10th Streets NW), Washington, D.C. (Shaw, just west of the convention center). (202) 450-1015. Reservations: Open Table. Spring is finally here, and spring produce is already showing up in markets. Although there are joys year-round of eating seasonally, there's something about spring produce that fits the season so well. It's so green, so vibrant, so alive, after months of eating imported off-season produce and dried and canned goods during the winter. 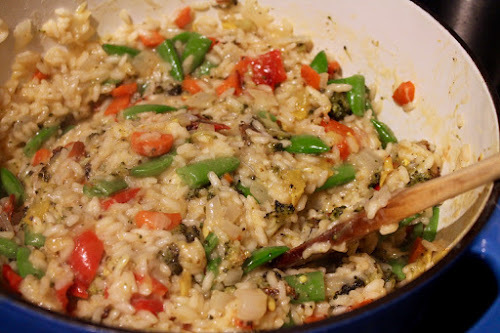 I find risotto to be a particularly good vehicle for showing off spring produce, and I find I make the traditional dish of rice cooked in broth with vegetables and cheese most frequently from March to June. I've shared several variations of pasta primavera, "primavera" meaning "spring" in Italian, usually denoting a dish made with seasonal spring vegetables like asparagus, peas and greens. The vegetables in this dish most closely resemble what I used in my first Pasta Primavera recipe, which was inspired by the primavera recipe in The New Basics Cookbook by Julee Rosso and Sheila Lukins. I treat the vegetables in different ways here. 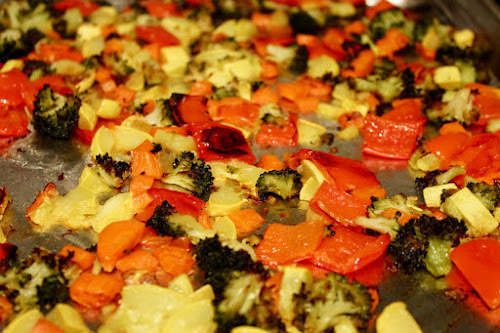 Most of them--the red pepper, broccoli, carrot and squash--are roasted in the oven until lightly browned around the edges. The onion is sautéed and cooked with the rice and the sugar snap peas are lightly blanched in the broth. Everything is combined in the end with a generous helping of finely grated pecorino-romano, the hard-cheese alternative to parmigiano-reggiano that's perfect for spring dishes. Note: Carnaroli rice is an Italian rice similar to arborio. 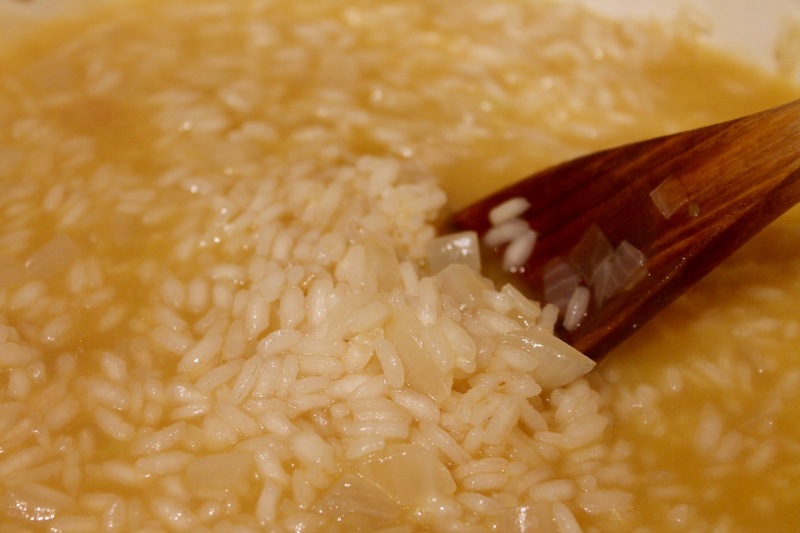 Both are popular choices for risotto. Carnaroli rice has a higher starch content than arborio rice, is a bit longer and has a firmer texture. 2. Combine red pepper, broccoli, squash and carrot in a large bowl. Drizzle with 2 tbsp. of olive oil and salt and toss to coat. 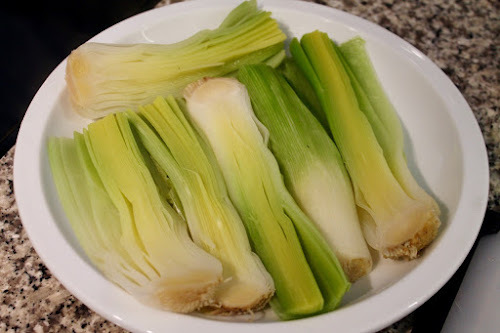 Spread vegetables in an even layer on baking sheet (line with aluminum foil for easier clean-up) and roast for 20-25 minutes until lightly browned. Stir the vegetables and continue roasting another 10 minutes until most vegetables are browned around the edges. Set aside while you make the risotto. 3. Heat vegetable broth in a large saucepan until boiling. Add the sugar snap peas and cook for 2-3 minutes until crisp-tender. 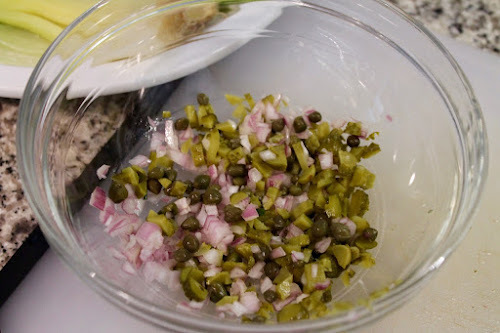 Remove peas with a slotted spoon and set aside. Reduce the heat under the broth to the lowest setting. 4. Heat remaining tbsp. of olive oil and butter in Dutch oven over medium heat. Add the onion and sauté until softened, about 8-10 minutes. Add rice and cook, stirring occasionally, until lightly toasted, about 3-4 minutes. Add wine and stir to combine. Cook until the wine is absorbed by the rice (when running a spoon across the bottom of the pot leaves a dry space). 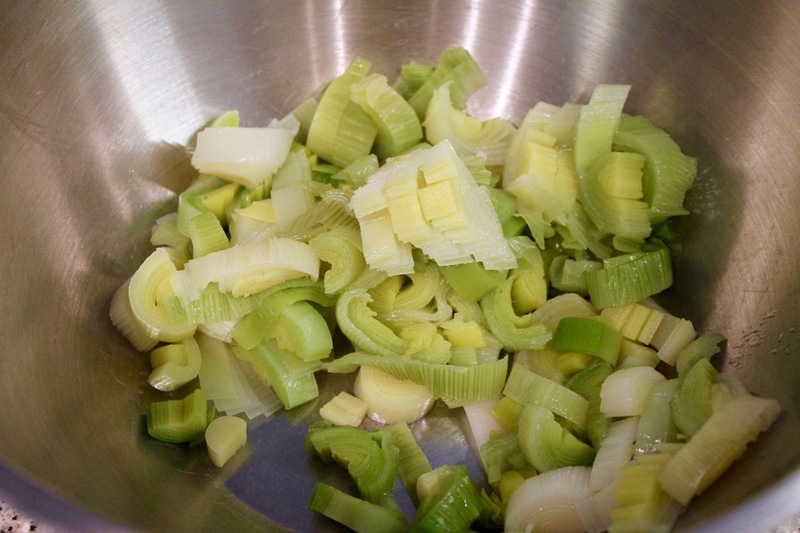 Add 2 cups of chicken broth, stir to combine, and simmer over medium heat until the broth is absorbed. Then, continue adding broth by 1/2 cupfuls, stirring to combine, stirring occasionally as the mixture cooks and waiting between additions until the previous addition is absorbed by the rice. In total, this should take about 20-25 minutes. Taste the rice once about 5 cups of broth are incorporated, as it may be done before all the broth is used. The rice should be "al dente"--that is, cooked through but still a bit chewy. 5. 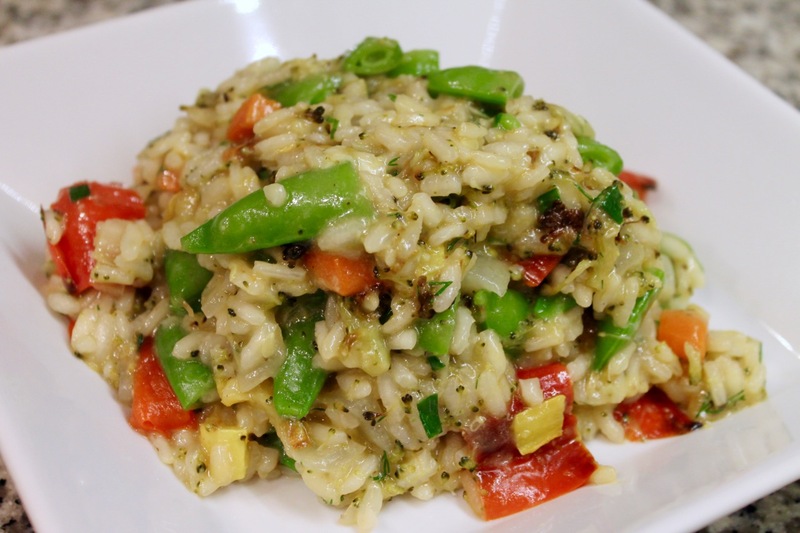 Stir in the roasted vegetables, blanched sugar snap peas, pecorino-romano cheese, nutmeg, pepper, dill and chives. Serve in shallow bowls. 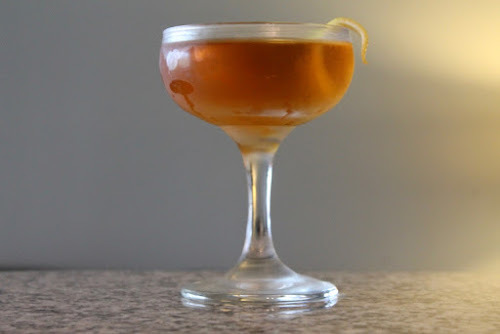 I came across this drink while perusing The Savoy Cocktail Book, by Harry Craddock, the 1930s classic of cocktail literature. Martini fans should be encouraged to try this drink, a mixture of gin and vermouth (both dry and sweet) with a touch of Benedictine liqueur. I added the orange bitters, as I think most cocktails benefit from their finishing touch. The original recipe's ratio of base spirit (gin, in this case) to other ingredients is 1:1. I've upped the proportion of gin, making it it 2:1, which is in keeping with our modern taste for slightly stronger drinks. I also stirred the drink instead of shaking it like the book says, since the drink is composed entirely of boozy ingredients (shaking is better employed for cocktails that include juices or syrups--ingredients that won't mix well with just stirring). Similar changes were made when the drink appeared in Imbibe magazine. Combine gin, vermouths, liqueur and bitters in a cocktail mixing glass with ice. Stir until very cold, then strain into a chilled coupe glass. Garnish with lemon twist. I've had few foods simmered in wine that aren't delicious. 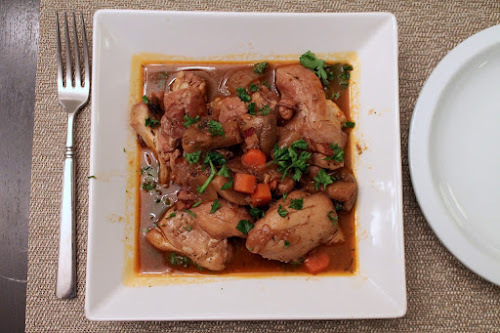 Coq au Vin is one true classic of the genre, but all that flavorful simmering can take time. 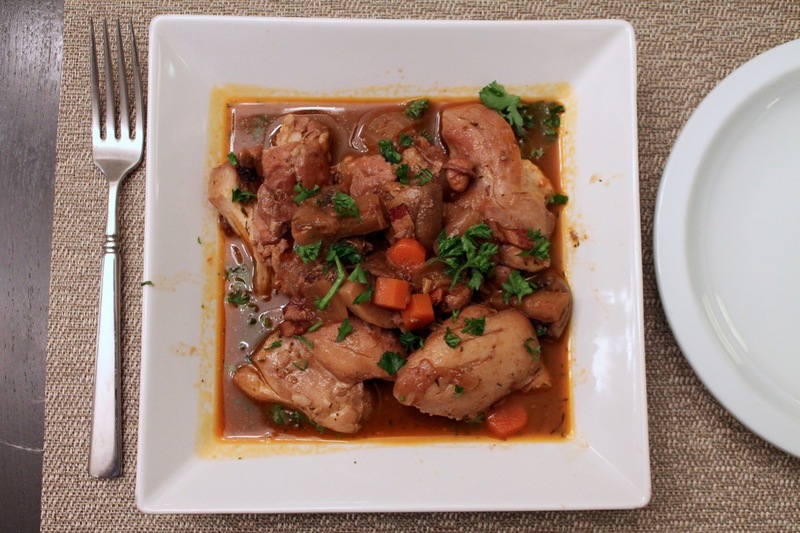 A Bon Appétit recipe I looked at braises the chicken in the oven for 1 and 1/4 hours. 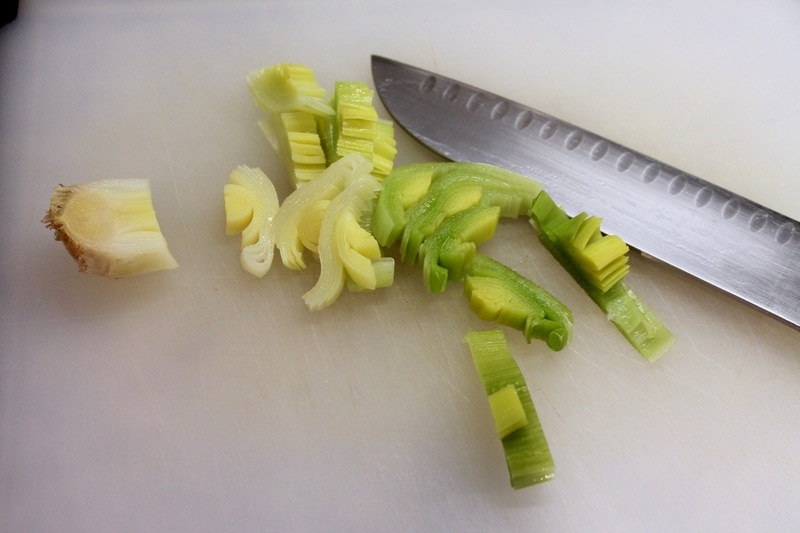 When you consider the other prepping, sautéing and reducing steps, you're looking at a recipe that's easily at least 3 hours to make. 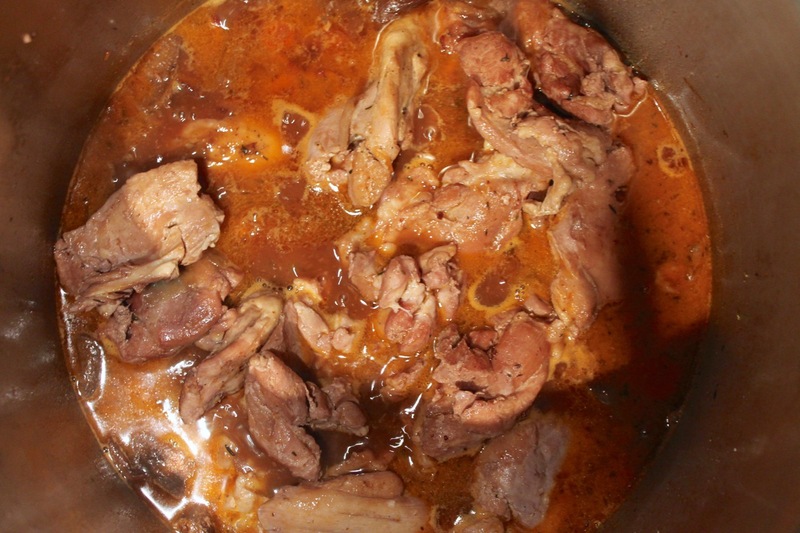 Braising the chicken in a pressure cooker speeds up the cooking time considerably. This is still by no means a "quick" meal--it took me over an hour--but it's certainly an improvement over something that takes all afternoon. 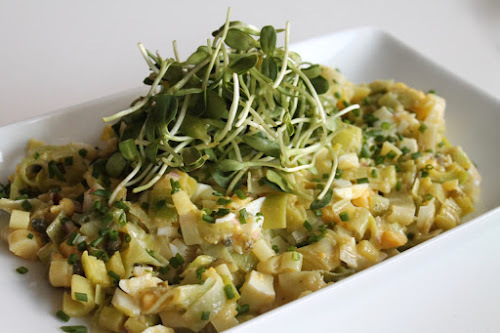 Barbara Schieving and Mark Bittman's recipe, combining the elements I liked best from both. These recipes are pretty similar although they call for drastically different quantities of liquid. Schieving's recipe calls for 1 cup of wine and 1 cup of stock, which she thickens with cornstarch; Bittman's recipe calls for twice as much liquid, and the resulting sauce it thickened only by reduction. That can take time. I sought a happy medium by using 1 1/2 cups each of the wine and the stock and letting reduction and tomato paste thicken the sauce. Note: This recipe uses a stove-top style pressure cooker. My model is a Fagor Duo 8 quart. 1. Place dried mushrooms in a small bowl and pour 1 cup hot water over them. Set aside. 2. 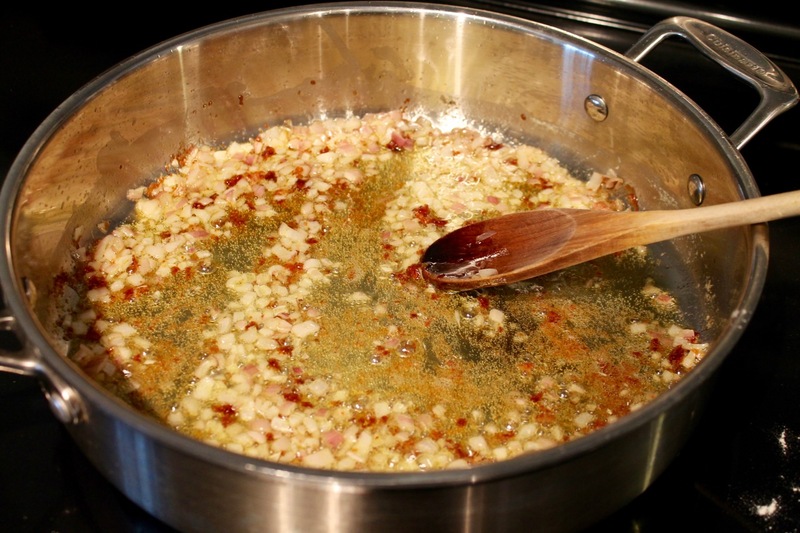 Place the pressure cooker pan on the stove over medium heat and add the bacon. Cook, stirring occasionally until browned and crisp. Remove the bacon with a slotted spoon and set aside on a paper-towel-lined plate. 3. Increase the heat under the pressure cooker pan to medium-high. 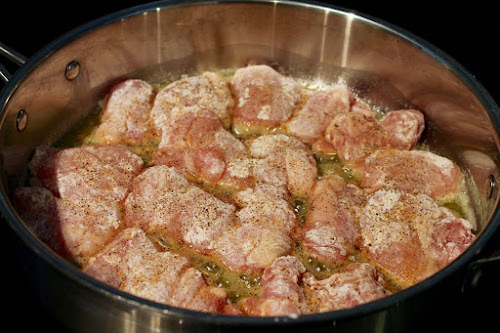 Add half the chicken thighs and brown on both sides, about 3-4 minutes per side, seasoned to taste with salt and freshly ground black pepper. Remove the browned chicken thighs and set aside on a plate. Repeat with the remaining thighs. 4. Add the onion and mushrooms to the pan and sauté until softened and lightly browned, about 5 minutes. Add the garlic and carrot and sauté another 2-3 minutes. Add the wine to the pan and stir to deglaze the pan, then add the chicken broth, thyme, bay leaf, tomato paste, cooked bacon and browned chicken. 5. Lock the lid onto the pressure cooker and set pressure setting to "high." When pressure is reached (it may take about 5 to 10 minutes), reduce heat to simmer and maintain pressure. Cook for 10 minutes under pressure. Place the pressure cooker in the sink and pour cold water over the lid to release pressure. Remove the lid, then remove the chicken and set aside on a plate. 6. Place the pressure cooker pan with the remaining ingredients on the stove and heat over medium-high heat until boiling. Add the porcini mushrooms along with their soaking water. Boil until the mixture reduced by about half. Reduce heat to medium, stir in the butter, then add the chicken and cook on medium for a couple minutes to reheat the chicken. 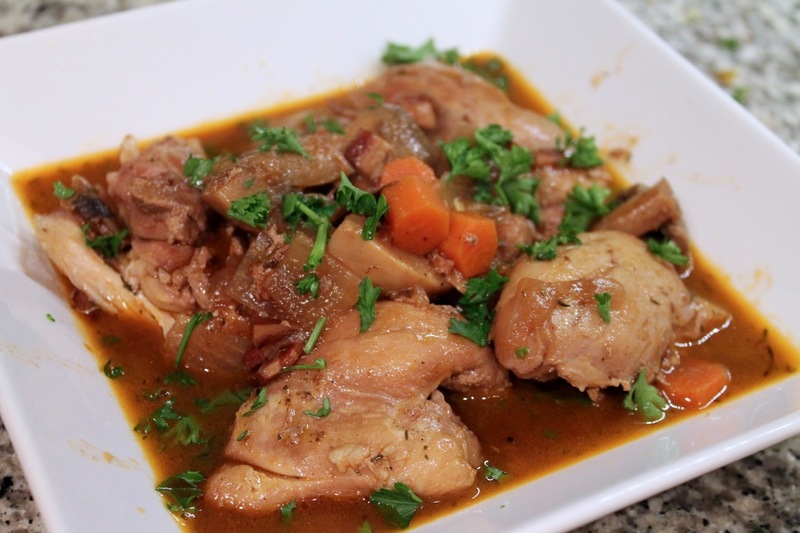 Serve the coq a vin in shallow bowls topped with a sprinkle of parsley. Is it just me or is "cacio e pepe," which is Italian for cheese and pepper, everywhere all of a sudden? While not a new dish, this simple combination of hard Italian cheeses--usually pecorino-romano but often also parmigiano-reggiano--combined with freshly ground pepper is really hot right now, popping up on recipe sites and restaurant menus. Mashable named it the "coolest pasta of 2016." As simple as this dish sounds, there are some fundamentals to keep in mind to make it right. You're not just going to cook noodles and toss them with cheese, butter and pepper. There's a little more finesse involved. 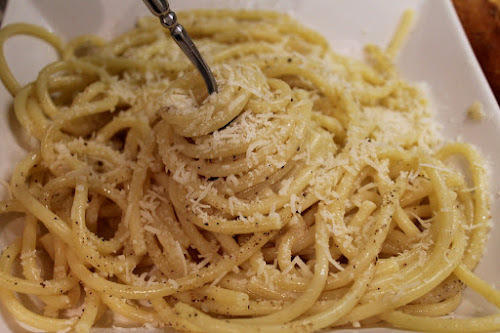 With cacio e pepe, you're actually making a cheese sauce, albeit a very simple one. 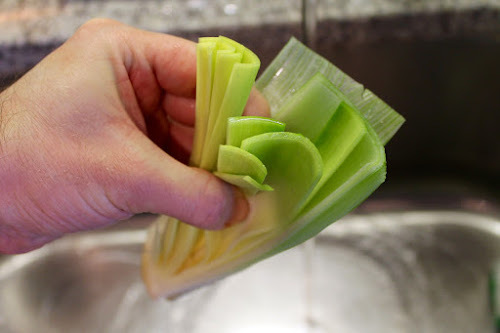 Although it's not listed in the ingredients for the recipe, the key ingredient in this dish is the pasta cooking water--hot (but no longer boiling) salty water saturated with starch sloughed off from the cooked pasta. 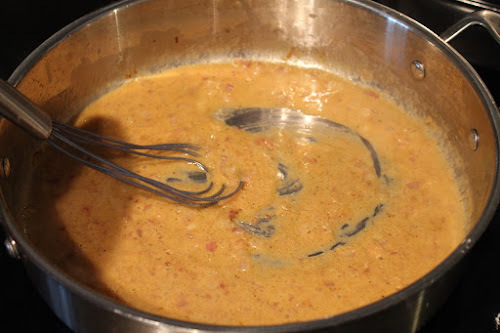 In this dish, finely grated cheese is whisked into this hot water, which melts the cheese. The starch in the water acts as a stabilizing ingredient. 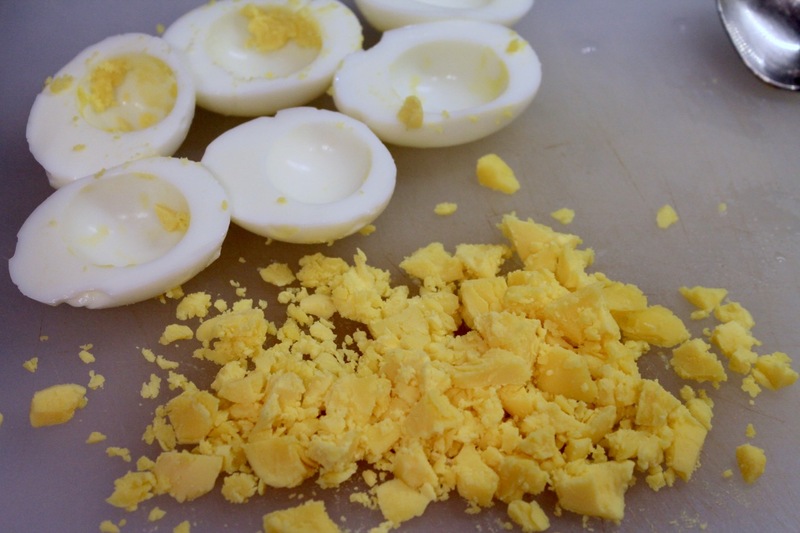 According to Harold McGee in On Food and Cooking, starch coats the protein and fat components of the cheese and keeps them from coming back together. He also notes that when cheese are exposed to temperatures above their melting point, they tend to get clumpy. Since the melting point of pecorino and parmesan cheeses is about 180 F (and the boiling point of water is 212 F), you don't want to "cook" this sauce on a hot stove, but you also don't want that leftover pasta cooking water to sit around too long get cool, at which point it won't be warm enough to melt the cheese. That's what actually makes getting this dish just right a bit challenging--you want that sweet spot temperature that will make a the cheese melt into a smooth sauce. When I made it, I think my water may have been a bit too hot, as my sauce was a bit clumpy. This is the sort of dish that benefits from repeated experiences until you get it right. 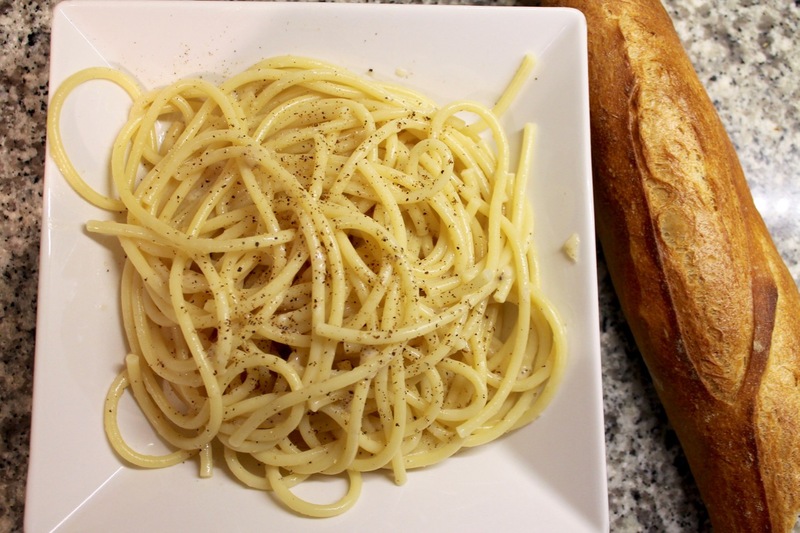 Whether you put other ingredients in cacio e pepe pasta is up to you. Some insist that it needs nothing other than pasta, cheese and pepper (some even insist that it only be made with pecorino romano and not also parmesan). On the other hand, America's Test Kitchen's recipe includes cream and olive oil. I added some butter to my sauce to increase its richness and because butter and pasta just go together so well. Note: I used a Microplane to finely grate the cheese. In addition to the ingredients below, you'll need to reserve about 1 1/2 cups of the hot pasta cooking water once the pasta is done cooking. 1. Place 2 oz. 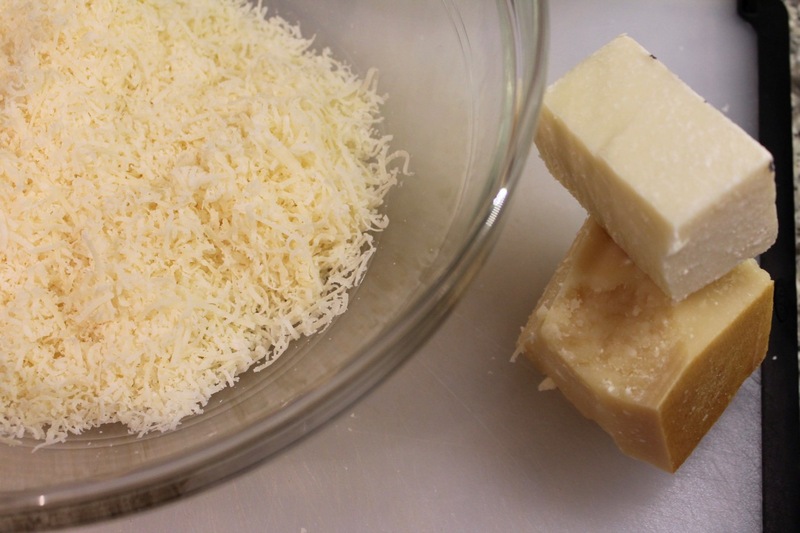 of the pecorino-romano and all of the parmigiano-reggiano cheese in a medium-size bowl. 2. Heat a large pot of salted water over high heat until boiling. Add the pasta and cook, according to package directions, until al dente. 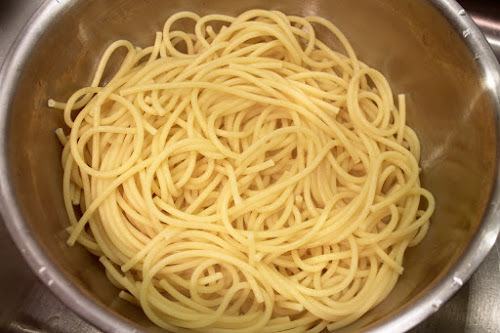 Working quickly, reserve 1 1/2 cups of the pasta cooking water, then drain the pasta in a colander and set aside in the large pot off the stove. 3. 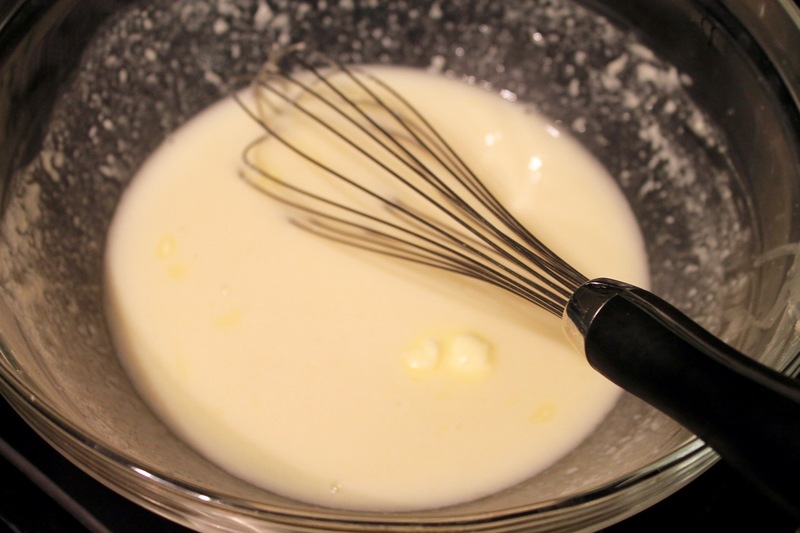 Slowly whisk 1 cup of the hot pasta cooking water into the medium-size bowl with the mixture of grated cheeses until they form a smooth sauce, then whisk in the butter and pepper. Pour the sauce over the pasta and stir to combine. Serve the pasta in shallow bowls topped with additional grated pecorino cheese and, if desired, more freshly ground pepper. The D.C. restaurant scene today is crowded with chefs that many people--inside and outside the city--will recognize by name. People like Mike Isabella, Aaron Silverman, Marjorie Meek-Bradley (currently on Top Chef!) and, of course, José Andrés have elevated the profile of our local cuisine and let the masses know we've come a long away from the K Street steakhouse. But before there were plans for galleria food courts, tapas derived from various international cuisines and 2-hour waits on 8th Street SE there was Nora Pouillon, an Austrian transplant to the U.S. She opened Restaurant Nora in 1979 with a focus on local, organic and seasonal ingredients. These are commonplace terms in restaurants today, but in 1979, they must have been a revelation. According to the restaurant's website, in 1999, Restaurant Nora become the first certified organic restaurant in the United States--even today, there are just a handful of such establishments. Tucked away in a non-commercial corner of Dupont Circle a couple blocks off Connecticut Avenue, Nora's look is pleasantly simple and old school. Although surely the interior has been redone since 1979, the restaurant has a decidedly "retro" feel, as it lacks a lot of the design touches so common in new restaurants. I actually rather liked this, as I thought the simpler decor made for a cozier experience. And, as the son of a quilter, I enjoyed the wall quilts that comprise the primary decor throughout the restaurant. I'm instantly smitten with Nora's cocktail menu, because it's actually just five variations of my favorite cocktail: the Manhattan. 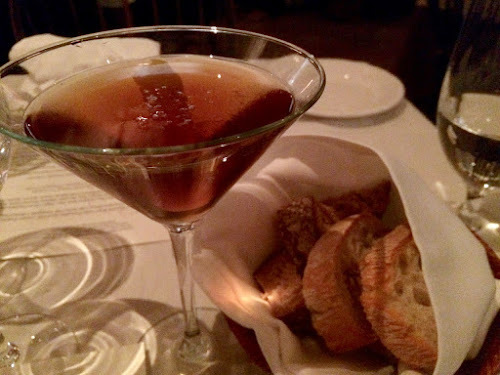 The Hell's Kitchen was my favorite, a perfectly balanced blend of bourbon, Lillet Blanc, sweet vermouth and black walnut bitters. Almost as good was the The Big Apple composed of bourbon, dry vermouth, amaretto and chocolate bitters. Generally I'm a stickler for Manhattan's being made the traditional way with rye whiskey instead of bourbon, but Nora's Manhattans were so good that I cannot possibly fault them for only offering the drink made with bourbon. 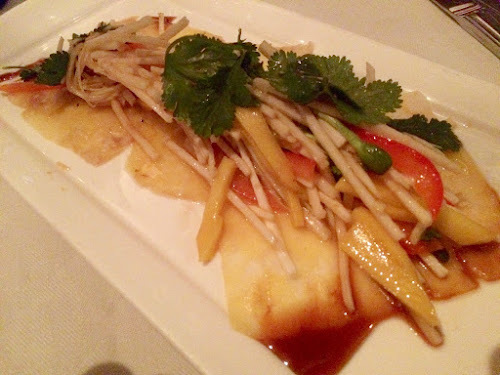 For my first course, I chose Hawaiian Hearts of Palm Salad with Pineapple Carpaccio (i.e. very thinly sliced), Ginger, Red Peppers and Citrus Sesame Vinaigrette. I chose this because I thought it was the most interesting salad on the menu and I liked it a lot. 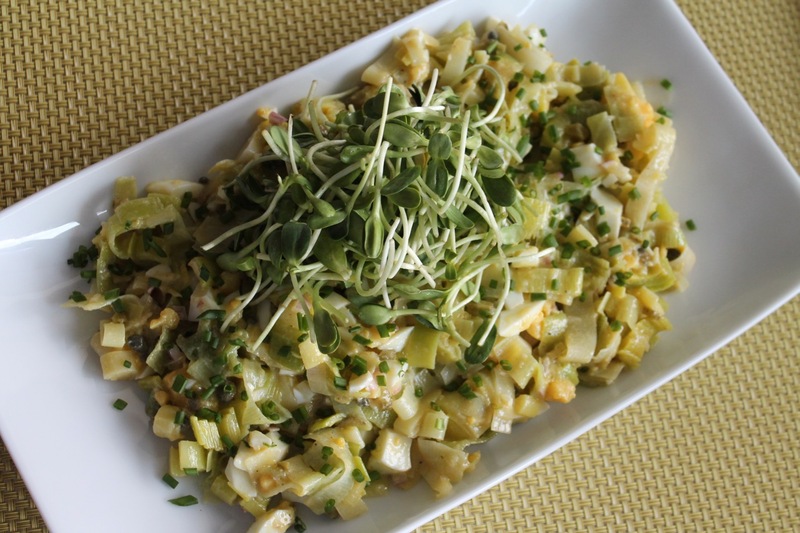 The hearts of palm were cut julienne instead of the typical round slices, which gave the salad a nice presentation. 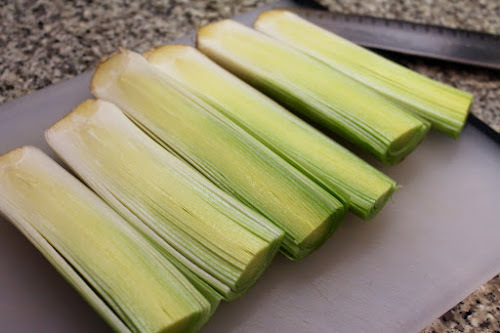 And cutting the pineapple very thin was smart, as it kept the pineapple flavor from overwhelming other ingredients in the salad. The other salad selections sounded good, but they are salads I've seen before, such as greens with gorgonzola, pear and pecan or Caesar. 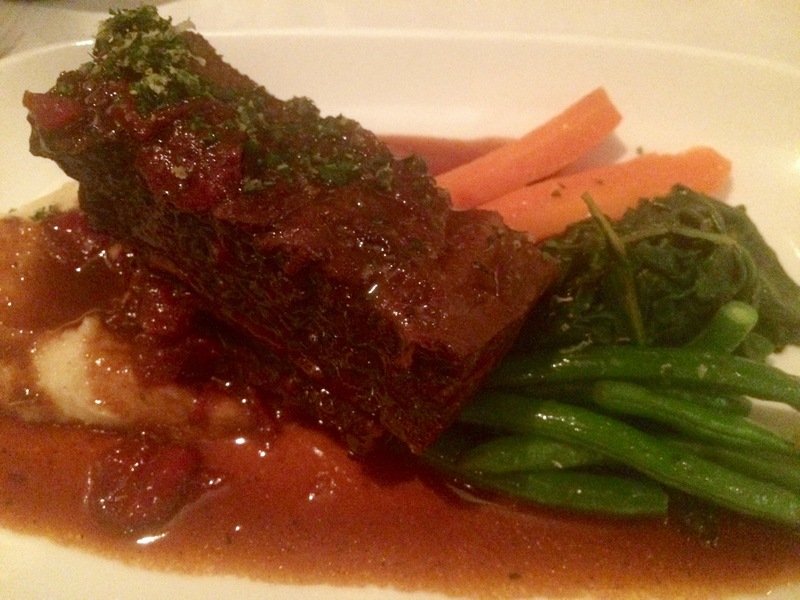 Moving on to the main entree, I went with a braised short rib, which was tender and flavorful and accompanied by a typical but well-prepared assortment of vegetables. Again, the entrees aren't a place to find a lot of surprises, comprising a familiar mixture of meat and seafood choices such as grilled salmon, steak and roast chicken. The item that stands out as most unusual is a crispy tofu Tokyo hot pot--until you remember that Bouillon used to also oversee Restaurant Nora's sister establishment, Asia Nora, which closed in 2007. We finished the night with a Fuji Apple Pie with Calvados Ice Cream. Calvados is French apple brandy, and I was intrigued by this, as I'd never seen an apple brandy ice cream. The ice cream turned out to be nothing special--it was sweet and creamy but not particularly flavorful. But the apple pie was incredibly good with its warm, nicely textured apple filling and perfectly flaky crust. 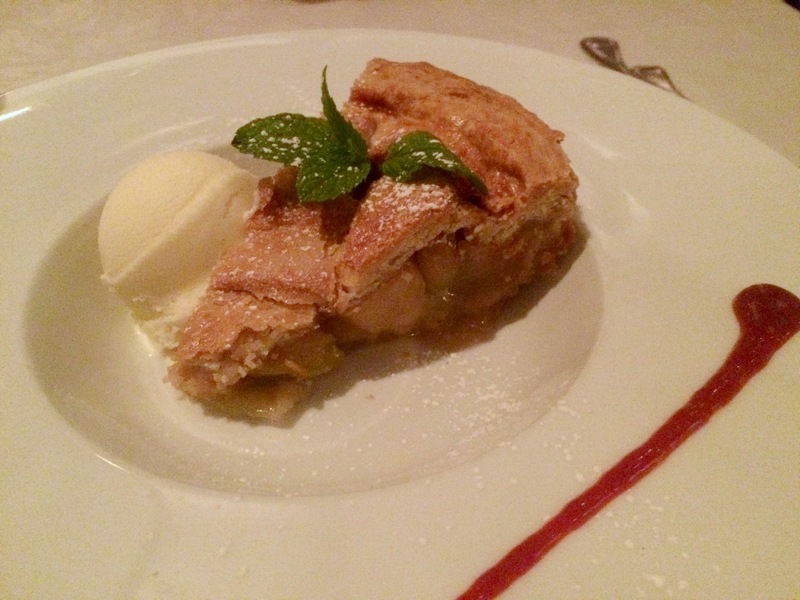 It's probably the best apple pie I've ever eaten in a restaurant (and yes, I've had the Blue Duck Tavern apple pie, which I found to be overrated). 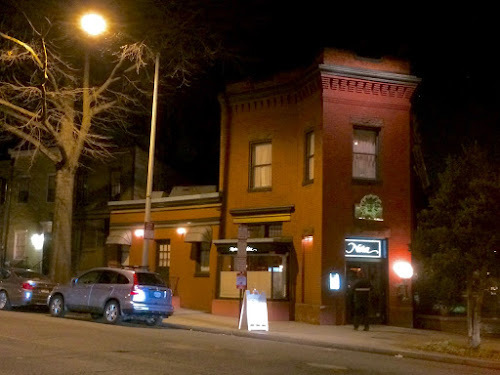 Overall, we enjoyed our dinner at Nora, certainly one of the most influential and long-lasting dining institutions in D.C. A word of caution though: be prepared for the bill. The prices, while not outrageous, were a bit higher than we expected for what we had. Presumably, that's the premium you pay for Pouillon's fastidious sourcing. The menu states that over 95 percent of its ingredients are supplied by "certified organic and biodynamic growers and producers." If that's very important to you, you probably don't mind paying for it. If it's not, you may wonder whether Nora's $30 to $42 entrees are really worth the organic surcharge. Still, I'm glad to have had the chance to sample the food at one of the pioneering establishments of D.C.'s increasingly well regarded restaurant scene. Restaurant Nora, 2132 Florida Avenue NW (at the corner of R Street, 2 blocks west of Connecticut Avenue), Washington, D.C. (Dupont Circle). (202) 462-5143. Reservations: Open Table. 8-2-Eat is my food-focused list series. A perfect Friday distraction.Earlier this week, my friend Laura, who blogs at Mother Would Know, shared her recipe for Not-Quite-Homemade Chicken Mole, which looks delicious and got me thinking about all the dishes I've made with mole sauce or inspired by its flavors--that wonderful combination of spices, chiles, nuts and chiles that is so amazing good. Here's a rundown of all the delicious possibilities. 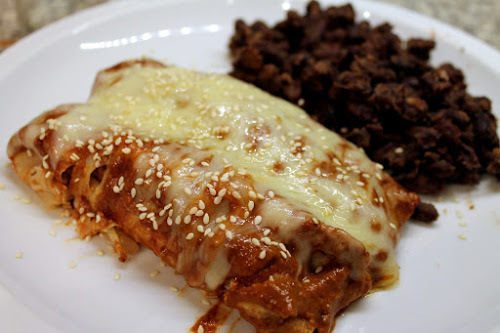 Mole Chicken Enchiladas. Chicken Enchiladas con Mole Poblano is probably the most common way that mole sauce is used in Mexican restaurants in the U.S. One of the reasons mole may seem daunting to many cooks is the look list of ingredients, but this recipe from Robb Walsh's The Tex-Mex Cookbook pares the ingredient list down to the basics. 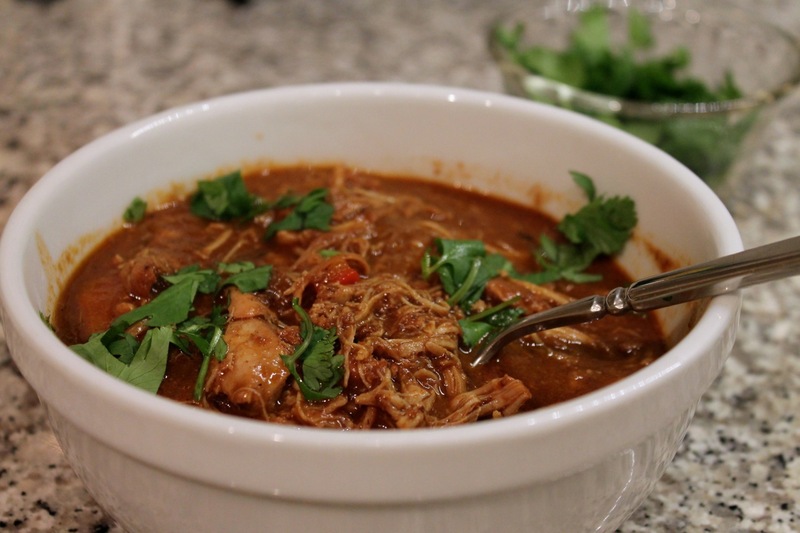 Pressure Cooker Mole Chicken Chili. Don't have all afternoon to simmer something in a rich mole sauce? Use a pressure cooker to speed up cooking time. This recipe, adapted from America's Test Kitchen's Pressure Cooker Perfection, is done in an hour and change. Mole Brined Roasted Turkey Breast. Departing from the traditional mole "sauce," here I've used the flavors of mole in a brine to infuse turkey breast for a flavorful Thanksgiving entree. Thanksgiving Mole Gravy. To go with that turkey? 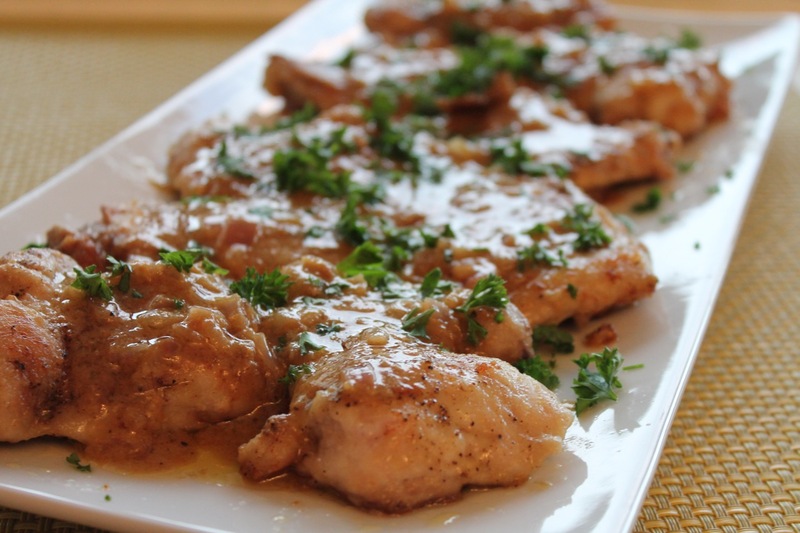 Naturally, you'll need mole gravy. This isn't mole sauce, but rather gravy with some mole sauce mixed in plus the drippings from the aforementioned turkey. Sweet Potatoes with Mole and Queso Fresco. Because I apparently can't get enough of mole at Thanksgiving, I created this sweet potato dish for Thanksgiving last year, but you could easily serve this any time of year. Here, I went with a longer, more traditional list of ingredients for the delicious mole sauce, but it's really just a case of "a little it of this, a little bit of that." It's not complicated. Mole Cookies. Yes, cookies. I created this for the 2014 Dallas Holiday Bakeoff with Dallas Decoder, representing Judith, the conniving whore-house-running matriarch of the Ewings' rival family the Rylands in the recent Dallas reboot. I got the idea for this realizing that many of the ingredients of mole work well in a dessert. Yes, they're a little bit spicy, but that's part of their allure. Improved Tequila Cocktail. Now we're going to drink mole, or rather Xocolatl Mole Bitters, which was the first product created by the amazing bitters producers Bittermens. This drink is a nod to the late 19th Century "improved" cocktail but updated with tequila, which I don't believe was fashionable in the U.S. at the time. 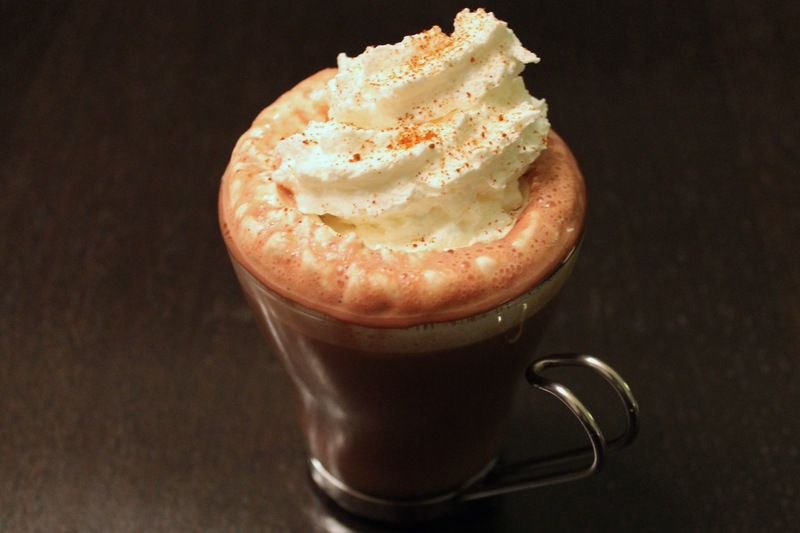 Spicy Aztec Hot Chocolate with Mezcal. Another cocktail with mole bitters, this one is perfect for winter--a mezcal cocktail riff on Mexican hot chocolate. I didn't specify the mezcal at the time I posted this, but you can't go wrong with Del Maguey Vida mezcal in this recipe.